What did the first global trading market look like? During the late 15th and early 16th century the world witnessed a revolution in commerce: the emergence of the first global trading market. Propelled by Portuguese and Spanish efforts in setting new navigation routes to America and also to Asia, as an alternative to the dominant Islamic ones, European ports thrived with new goods and an abundance of capital. It was an entirely new playground for the trade actors of the time, which required a reconfiguration of the old ways of doing business. But what did the trade network that emerged in the wake of these transformations look like? In a paper published in the Royal Society Open Science Journal, a joint collaboration between Portuguese history, physics, and computer science researchers sheds light on these questions. 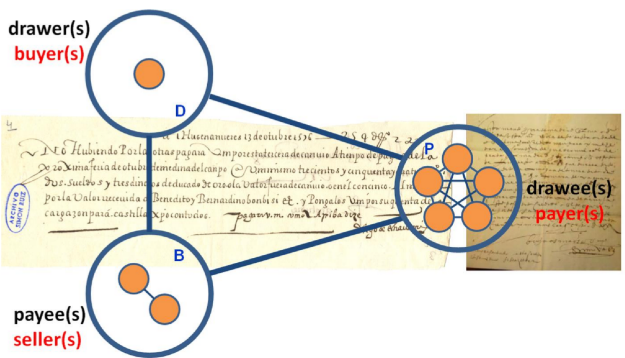 By analyzing data collected from thousands of documents of that time (see details at end), and employing state-of-the-art computational and mathematical methods from network science, the authors conduct, for the first time, a large-scale analysis of pre-statistical data associated with the 16th-century trade network. Depiction of a bill of exchange, and the trade network motif extracted from each, depending on the actors (disks) and the roles they played in the financial transition, as buyers, sellers, and payers. Such an unusual approach to historical data allowed the authors to carry out a quantitative comparison between the 16th century and the present financial market, making evident the remarkable similarities that exist between networks separated by 500 years in time, and which reflect similarly functioning paradigms that rely on fundamentally different technological means. Moreover, since the dataset spans half a century of transactions, it was also possible to show evidence of the rapid adaptation of the network in response to the geopolitical turmoil of the time. Despite this rapid adaptation, the authors find no changes in the overall mathematical properties of the network, which remained surprisingly robust throughout the entire period analyzed. Once again, this result suggests the existence of trade patterns that remain invariant throughout time. The project started with the manual curation of 21,000 bills of exchange (written orders requiring a payment) from the personal archives of Simon Ruiz, an influential Spanish merchant of the time. Documents were interpreted one by one, by resorting to paleography; from those of interest, the researchers extracted the number of actors involved, their names and roles, and also their geographical location. This information was then collected in a computer database for later analysis. The task of disambiguation was particularly tricky, as people at the time were not very consistent when writing their names. The data retrieval project stemmed from a multi-national funded collaborative research project called DynCoop Net, involving FCT (Portugal), MEC (Spain), and NSF (USA). The Portuguese team, from the Universidade do Porto, was responsible for the digitalization and subsequent interpretation of the contents of the Simon Ruiz archive. Only when the curation process was well advanced did the other participants of this work join in. At the time, the team had accumulated an unusually large amount of structured data, by historical standards. Understanding the big picture became crucial, a task that proved to be very challenging, but also highly rewarding. The article was published August 22, 2018. Ana Sofia Ribeiro, Flávio L. Pinheiro, Francisco C. Santos, Amélia Polónia, Jorge M. Pacheco. R. Soc. open sci . 2018 5 180577; DOI: 10.1098/rsos.180577. Pinheiro, Flávio L., and Dominik Hartmann. "Intermediate Levels of Network Heterogeneity Provide the Best Evolutionary Outcomes." Scientific Reports 7.1 (2017): 15242.